God is Coming Myles and Katharine recount how Abraham’s travels in the desert led him into dependence and relationship with his God. Interviews: Dean Bye, Director of Return Ministries; and Chaim Malespin, Director of the Aliyah Return Center in Tiberias, Israel. Humble Beginnings In a simple animal stall, Jesus (Yeshua) supernaturally came into the world as a baby, lived to fulfill the Law, and promised to return as the Lion of Judah. David and Kirsten provide the vocals for “Yeshua,” a song written by Zola Levitt. 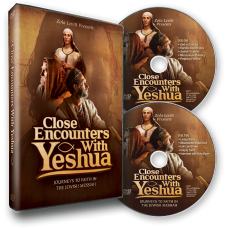 Jewish Context As a boy, Yeshua came to the Temple to offer sacrifices. Later, He became the sacrifice, the Lamb of God. Interview: Karen Davis, Worship Director of Kehilat HaCarmel. Miraculous Ministry Near the Sea of Galilee, Yeshua performed many signs and wonders that amazed many but disturbed others. Interview: Eric and Terri Morey, founders of The Galilee Experience. Prophecy Fulfilled At a first-century synagogue at Magdala, likely visited by Yeshua Himself, Myles and Katharine remind us that Scripture is reliable. Interview: Pastor Juan Maria Solana, Director of Notre Dame of Jerusalem Center (Catholic) and founder of the Magdala Center. Living Water The Pool of Siloam was a place to perform cleansing rituals; there, Yeshua performed a miracle that proved He was a prophet, priest, and the King we await. Interview: Arab Pastor Vincent Shammas (Seeds of Better Life Center in East Jerusalem). Mountaintop Experience On the Mount of Transfiguration, God honored His Son. Yeshua gave authoritity to His Disciples and sent them out. Interview: Chaim Singerman of Jerusalem Hills Inn in Abu Ghosh. Life Laid Down Yeshua came down the Mount of Olives like a king; but in the Garden of Gethsemane, He surrendered His will for the Father’s plan. Interview: Carolyn Hyde, Heart of G-d Ministries. Empty Tomb Myles and Katharine remind us that the Crucifixion and the Cross led to the empty tomb, and thus removed the curse on mankind. Interview: Samuel Smadja, leader of Messianic Assembly in Jerusalem and owner of Sar-El Tours.